Updated at 7:30 p.m. ET: Investigators are preparing to announce that the death of Border Patrol Agent Nicholas Ivie in Arizona earlier this week was the result of friendly fire -- accidental gunfire from another agent who responded to the same scene, state and federal officials told NBC News on Friday. The conclusion is based on an analysis of the ballistics, the lack of evidence of other criminals in the area at the time, and other factors, the sources said. The FBI released a statement later on Friday confirming that preliminary evidence showed friendly fire was to blame in the shootings. "While it is important to emphasize that the FBI's investigation is actively continuing, there are strong preliminary indications that the death of United States Border Patrol Agent Nicholas J. Ivie and the injury to a second agent was the result of an accidental shooting incident involving only the agents," said James L. Turgal Jr., FBI spokesman, in a statement to NBC News. "At the appropriate time further information will be provided, but while the investigation continues it would be inappropriate to comment any further at this time." The incident involving Ivie and two other agents occurred Tuesday in a rugged area about five miles north of the US-Mexico border near Bisbee, Ariz. The agents had responded to an alarm from a sensor that tracks illegal movement along the border. 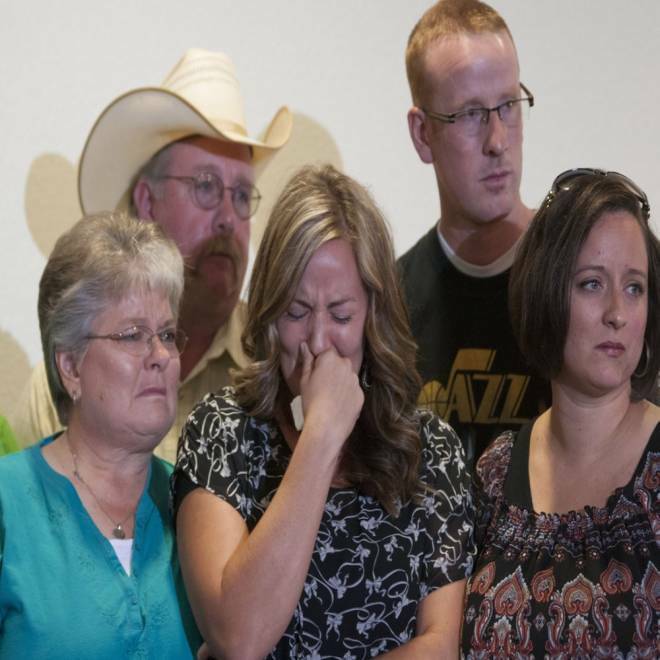 Christy Ivie, center, wife of Nicholas Ivie, holds back tears as she is surrounded by her father, Tracy Morris, and mother, DeAnn Morris, left, and her sister, Jan Cloward, and brother, Travis Morris, right, during a news conference on Tuesday. Ivie was killed. A second agent was wounded and was released from the hospital after undergoing surgery. The third agent was unharmed. State and federal officials said immediately after the incident that the shootings were committed by armed criminals. And since then, Mexican authorities have said they arrested two men in Agua Prieta, northern Sonora state, a few miles from where the shooting occurred.